Demand a more accurate picture of war by signing the petition to NBC below. NBC has created an entertainment show that breaks new ground. "Stars Earn Stripes" is co-hosted by retired U.S. general Wesley Clark. 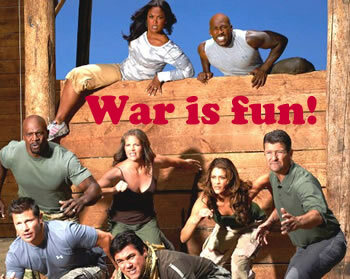 NBC promoted the show during its Summer Olympics telecast as the next big sporting event. But the sport it's exhibiting is war. On "Stars Earn Stripes," celebrities pair-up with members of the U.S. military to compete at war-like tasks, including "long-range weapons fire." Only there isn't any of the killing or dying. Our wars kill huge numbers of people, primarily civilians, and often children and the elderly. NBC is not showing this reality on its war-o-tainment show any more than on its news programs. Other nations' media show the face of war, giving people a very different view of war-making. In the United States, our tax dollars are spent by the billions each year marketing the idea that war is a sport and associating the military with sporting events. Media companies like NBC are complicit in the propaganda. While 57% of federal discretionary spending goes to the military, weapons makers can't seem to get enough of our tax dollars. In the spirit of transferring veterans' care to the realm of private charity, "Stars Earn Stripes" will give prize money each week to "military-based charities" in order to "send a message." We have our own message that we will be delivering to NBC: Don't lie to us. One of NBC’s corporate parents, General Electric, takes war very seriously, but not as human tragedy -- rather, as financial profit. (GE is a big weapons manufacturer.) A retired general hosting a war-o-tainment show is another step in the normalization of permanent war. Glenn Greenwald: The Pulizer-Winning Investigation That Dare Not Be Uttered on TV -- NBC news programs have repeatedly used retired generals, pretending independence but getting their pro-war talking points from the Pentagon.